why the gods were angry at them. If thousands of birds had fallen from the sky in ancient Rome, everybody—from emperors, to warriors, to peasants and slaves—would have been in a state of complete and total panic. Cries of “Bad omens! The gods are angry! Terrible, terrible things are about to happen!” would reverberate throughout the empire. Everyone would stay home and bar the doors. Lawmakers wouldn’t convene. Schools would shut down. And the streets would run with blood as priests offered animal sacrifice after sacrifice to appease the gods. Today, some religious leaders are reacting in similar ways (sans the animal sacrifices, of course): trying to divine spiritual meaning from events in nature. 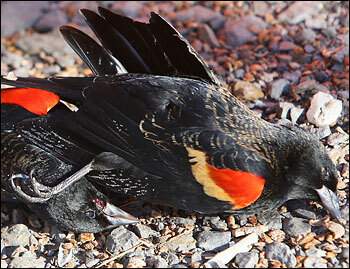 “God is angry,” some claim about the thousands of birds falling from the sky in Arkansas. “We must change our behavior to appease him,” say others. Still others maintain that this is the first sign of the apocalypse or end of the world. Biologists tell us that large numbers of animal “die-offs” are not uncommon. The fact that the birds in Arkansas died on New Year’s Day, however, seemed to have pressed our “primitive, ancient” reflex of trying to make sense of what we don’t understand. We wonder: what does it mean that so many died? And why on New Years Day, of all times? Surely it’s a sign! time of his death--what it "meant" that Vesuvius blew. Even if we don’t want to admit it to ourselves, we are all, on some level, on “high alert” for other “signs” from nature. Because despite our scientific advances, we still have the legacy of the frightened ancient person inside of us asking, but what does it mean? And will we survive it? We would be consulting the Sibylline books. That is, of course, if our own Stilicho has not already burned them. Then too, based upon those fabled books (the one's Tarquin finally bought) we might enact a most ancient ritual seldom used by the Romans: Human Sacrifice. Unfortunately, there are probably too many people today who would welcome human sacrifice and already have lists of suitable candidates. Indeed, we are not that far removed from our ancient ancestors. What? You mean it may not be the end of the world??? Wow, what a relief! We have the same "omens" as the ancients , just depends on interpretation. Thanks for a timely amusing article! I am so out of it! I would never have heard about the birds if it hadn't been for your blog. And modern or not, normal explanations or not, I'm having a hard time thinking it was 'nothing.' Gads. I'm clearly out of it too as I did not know about the whole dead birds thing. And I have to admit that if a bunch of birds fell out of the sky around me, I may start shouting Bad Omens too!